High–quality materials, stylish designs, perfect fits and functional details are what make Meyer trousers so special. 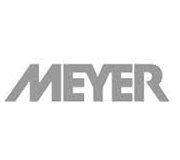 Headquartered in Germany since 1960, Meyer manufacture trousers in their own European factory. As an international men´s trouser specialist, Meyer deliver garments to 35 countries around the world, and in 4.000 different retailers. In order to continue to meet high standards, Meyer not only pay attention to excellent quality but also take responsibility. Compliance with international social and ecological standards in their own European manufacturing plant is regularly checked on site by FLO–CERT, the world´s largest independent social certification body.